Looking for a professionally designed web site to promote and market your books or new book release? 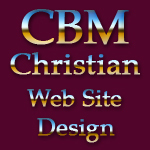 CBM Christian Book Marketing has over 12 years of online experience building and launching Christian websites, and building networks. In today's market having a professional author’s website is only half the equation. You must have a professional website and professionally market that website to even begin to create an audience and following. This requires years and years of design, launch, webmaster and online experience. Otherwise you are just a domain name lost in that huge online ocean called the Internet along with millions of other sites. CBM Christian Book Marketing has the experience and ability to not only design and launch a professional author’s website, but also to market it within our Christian network of sites. This ability provides authors with instant website launch into the Christian marketplace and creates expanded marketing that gets authors results on the major search engines. However, our services don’t end there. We also provide authors with solid advice that also helps them to promote and market their authors websites. Professional design, creation and launch. Expanded online website promotions & marketing. Build and expand your network ability. Target and captivate your market. Improve your professional image as a author. Provide a great online visitor experience. A How and Where to Order Page. Direct Link To Your Author Book Page at Amazon.